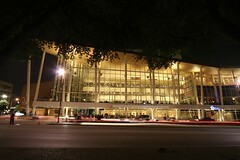 Houston’s own Brilliant Lecture Series presented former Secretary General Kofi Annan tonight at the Hobby Center. L. Scott Brogan is the political consultant and driving force behind the Brilliant Lecture series. Given I don’t swim in those circles I am curious about his role. You can’t just drop Sidney Poitier and Kofi Annan without a few connections. Tying in the previous posts on zoominfo, here is Scott Brogan’s zoominfo data. Light posting the rest of the week as I am traveling (again). This time to Chicago so I’ll get a pizza and beer for you. Ya, just you. Last thought – at the event it was no pictures. So you get a picture of the building. Despite everyone using their point-and-shoot cams to take 9999 photos. Frustrating. Why not just be progressive like NYC? Open photos – no flash? How hard is that? Grrrrr.